Now that I’m OMW to finishing the DC, I’m starting to put thought into my next tools. I need a Thickness Planer and a Jointer or a combo. I’m not sure what to look for. If price and space were no problem, I’d get both as pedestal base tools on mobile bases…..but it is. Even then though I’ve read a lot of reviews, but have no basis for comparison. I can’t find any good unbiased comparisons to point me in the right direction for type/brand/model. I see a lot of reviews, but there’s not a lot of comparisons. Most likely I’ll have to settle with a couple really nice bench-tops with spiral carbide blades, probably a 8” J and a 13” P.
I’ve used both machines before, but I am no expert. These will be my first for my shop. I’m going to make the rest of my workshop then Federal style furniture and cabinets for the kitchen. I want to mill the stock and be as precise as possible/needed. Since these will be my first joiner and planer, I probably don’t need all the bells and whistles, but which ones should I make sure I get? I don’t want to buy BMW when a nice Ford will suffice, or a F-250 when a F-150 is good for purpose, neither do I want to end up wasting $ on a couple Yugos. Long question short: Where’s a good guide/resource or thread to help me make an educated selection? -- If it's easy to do, you haven't spent enough time over engineering it. I don’t know of anything other than the Jet JJP-12 12” Jointer/Planer combo. It is a beast. Never could they get back to that perfect other side of the machine set up, lots of trial and error. I tend to not like TaE. I bought single use tools. That said I have a lot of room, that consideration more than any other would be what I would look at. Shopping used tools, you should be able to acquire a jointer, and planer for less than a good combo. Everything I read said stay away from the few really LOW $$$$$$$ combo tools out there. That has not been an issue for me yet. Hopefully it won’t be an issue ever. If you are taking multiple passes and introduce another board you will have to re-adjust to rough board thickness and start over anyway. I have a Hammer A3-31 12” jointer/planer. It has a hand wheel upgrade to the planer depth adjuster that has a dial indicator built into the hand wheel. It is very accurate; I can return to to exact thickness setting easily. This machine is a workhorse in my small shop and I am very happy with it. It is heavy, accurate and very powerful. Converting between functions is simple and fast. Before the Hammer, I owned an Inca 570 J/P with a Tersa quick change cutter head for 25 years. It was a great little machine, but was light weight, a little under powered and the thickness adjustment was not nearly as accurate as the Hammer. The Tersa cutter head was nice. My Hammer has straight knives that are relatively easy to change. If I were to purchase again, I would get the spiral cutter head. It’s pricy, but it makes a lot of difference. I have the Jet 12 inch with segmented cutters and I won’t say it is perfect, but it is pretty nice. My garage is 9 feet by 18 feet, so I needed a compact solution and this works for me. To me, the jet is a mid level machine, the Hammer is more money and a a grizzly is less money (less cutters too). I want to get the wexley remote digital readout for the planer, but other than that, I’m happy. Oh longer beds would be nice as well, but then it probably wouldn’t fit in my garage. I think the Rikon is similar, but less money. I bought a dewalt 735x for $650 and an 8 inch spiral carbide cutter jointer from Cutech https://www.cutechtool.com/category-s/107.htm. I’m really a beginner, but the Cutech jointer was a really good value and seems to be a quality machine. In retrospect I might have bought their package jointer/planer combo as it would have been much cheaper together. Definitely glad I got the 8 inch jointer over a small 6 in, and the 13 inch planer has been great too. I had considered a combo unit and liked the idea of getting two tools in one but it was out of the budget at this point in time (particularly with a heilex head). 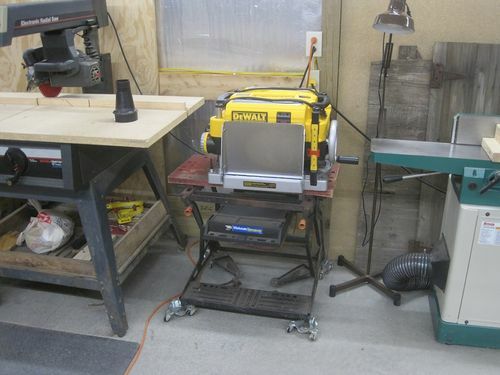 I then had the opportunity to snag a Dewalt DW735X Planer (with extension tables and extra set of knives) for $450 on Amazon last May when they dropped the price for a day or so. 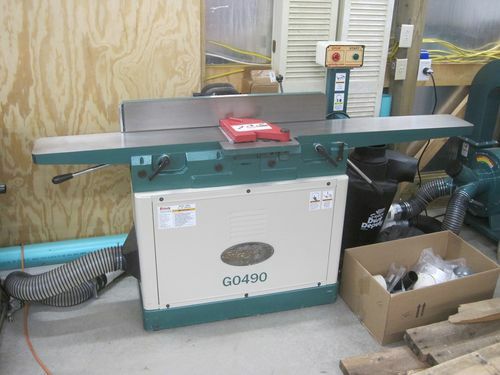 I was then able to find a Grizzly G0490 Jointer on Facebook Marketplace in great condition for $750 (he was asking $800) and had it in my shop the same day it was posted. After having the machines in my shop for about a year I am very glad that I went this route and didn’t get a combo unit. The Dewalt DW735X is a great planer and quite capable. The size is relatively compact though it is quite heavy and well built. The motor is quite powerful and the chip ejection fan does a good job (you definitely want to have it ducted or a collection container). Thus far the standard knives are performing well though when both sets are worn, I would like to change over to a Shelix cutter head for added durability and cutter life. I presently have it on a B&D Workmate w/ wheels, but would like to add a portable cabinet for it at some point. The 8” Grizzly G0490 Parallelogram Bed Jointer is a fantastic machine and was my first Grizzly purchase. The long bed is a huge plus (particularly in comparison to the shorter beds on many combo units) and provides a long and stable platform for jointing purposes. The jointer has plenty of power, is easy to use, has good features and appears to be of good quality. I may eventually add a Shelix cutter head but this would likely be after converting the planer (which can do a final clean up from the jointer if necessary). The jointer can also be used for boards wider than 8” by removing the blade guard and using a method to run it through the planer to complete the process. I think that having two separate machines makes it easier to spontaneously run a board without having to go through the hassle (as relatively simple as it may be) of changing from one process to another, and I have found the jointer to come into use much more in my shop than I originally thought it would. It also helps in being able to more swiftly process wood to a S4S end product, making it a more simple activity. While it can be difficult to do with some products (i.e. Grizzly and a few others), I would recommend you get your physical hands on as many machines as possible and it can be quite valuable in finding the concept and machines that work best in your individual situation. Everyone has different wants and needs and fortunately there are a wide range of options to choose from (though at the same time, with a corresponding array of prices too). I have the Jet 12” combo with helical head, and like it very much. If you happen to live in, or near, or visit the PNW, there is a Jet/Powermatic outlet store in Auburn, south of Seattle. They frequently advertise on the Seattle CL, and their prices offer a significant discount. If I remember correctly, mine was about 25% less than MSRP. Can’t tell you the name of the outfit, as they don’t mention their name in their CL postings. I just checked, and they don’t have a combo machine right now, but they come up quite often.